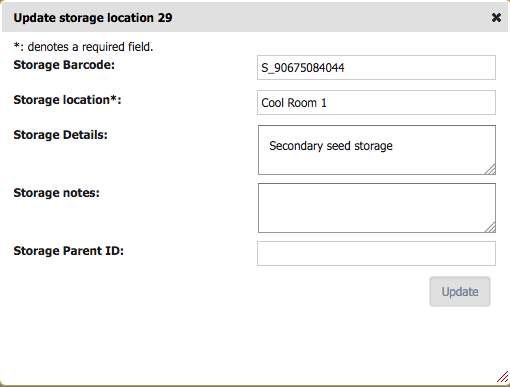 Storage locations are elements of Inventory and can be created to organise where various entities are stored for Trials and Nurseries. Most commonly these will be used for grain storage, however this is not a limitation. Each storage location may have a single parent which creates a hierarchical structure that can be explored by viewing the children of a single parent location. Storage Barcode A Barcode to identify the Storage location. Storage Location M A name to identify the Storage location. The following illustration shows some demonstration storage locations, filtered to display parent locations (using the top filter button). Note: Filtering is in effect by the presence of the Show all storage locations button. 1 Expand Inventory in the main left-hand menu, then select Storage Locations which will display a window as in the above illustration. 2 Select Add Storage Location. 3 Complete the mandatory Storage Location field. Note: All fields can be updated later if required. See the following ‘Update Storage Location’ illustration which is similar to the Add window. 4 Select the Add button to create the storage location. 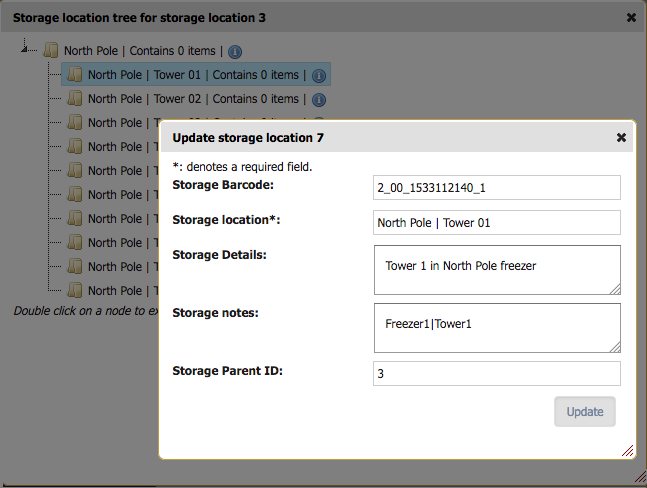 The next example shows the Update Storage Location window which is very similar for Adding a new Storage Location. At the Storage Location window select the button adjacent to the required parent storage location to display the child locations. The following example illustrates an expanded view showing all the children storage locations of the selected storage location. From the example above selecting the Info button adjacent to the location presents an update/view pop-up window as illustrated next to facilitate quicker/easier viewing and updating. Items are elements of Inventory and represent the various stock and samples that can be used in future experiments or for post experiment operations and analysis. Each item is generally associated with a specimen, which may or may not be used in a trial. This reflects how different samples can be extracted or harvested from the specimens that are used in experiments. Storage The Storage Location where the item is stored. Item Operation If item is derived from other items by taking sample or grouping (mixing) it can be defined here. 1 Expand Inventory in the main left-hand menu, then select Items to display the Add window. Note: The Add window appears similar to the following illustration of the Update Item window. Complete the mandatory Item field. All fields can be updated later if required. Whilst Trial Unit Specimen Id is not a mandatory field, if used, the Item Specimen Id must match the Specimen Id of the Trial Unit Specimen. 4 If required, add an Item log type to add an “Addition” Item log for newly created Item. Note: It is mostly impractical to add Items individually. A more practical method is to Import Items from CSV which is described next at Import Item. The next example shows the Update Item window. Note: If required, an item log type can be specified to add an “Update” Item log for the item that is updated. Importing Items allows a large number of items to be added in bulk and from a CSV sourced from a Harvest method. 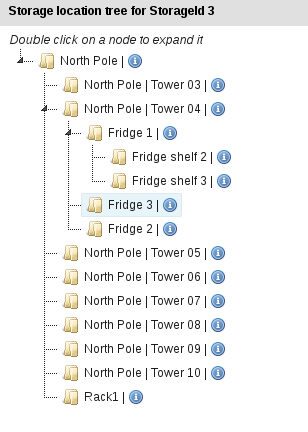 Storage Locations (refer to the Storage Locations topic) are already added in your KDManage. 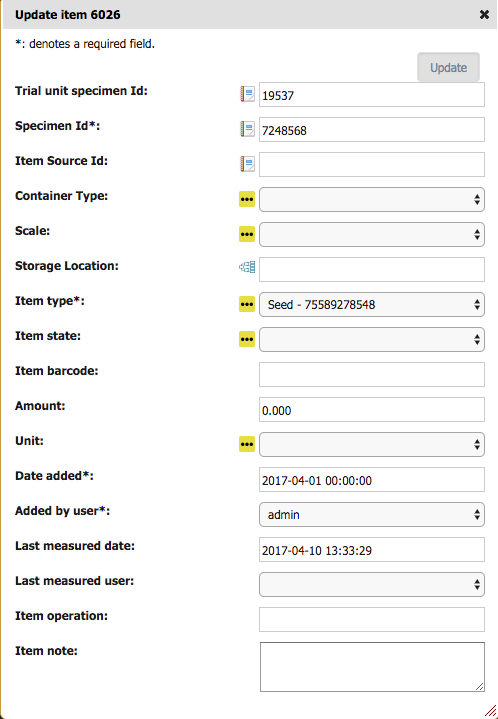 If a Barcode Configuration (refer to the Device Registrations topic), has been created for Items and the barcode column is not given, then barcodes will be automatically generated for new items. Use the IDs in columns of the CSV. When importing a CSV, the first row will not be added as KDManage will assume this is the Headings of each column. You may name these columns to the correct fields, to which the Import tool will automatically assign the columns to the correct fields. A single erroneous row will stop the process. The following example shows a small Item input CSV file (select to zoom). Note: Ids of entities are used in the columns of the CSV. The following illustration shows the Import Items window. 1 Select Items from the main left-hand menu then the Import Items button. 2 If the uploaded CSV has the headings specified in step 1, the column numbers will be automatically placed. 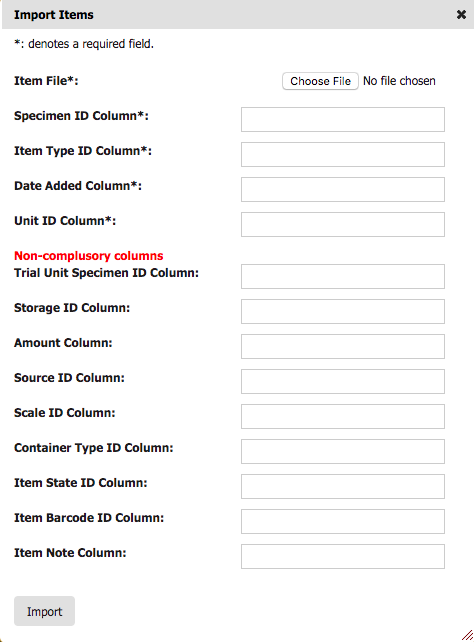 If not, users must specify the column numbers for each field. Leave a field empty if the field is not required to be uploaded. Note: mandatory fields must be included. 3 If required, add an Item log type to add an “Import” Item log for all newly created Items. Please note: only items with unique barcodes will have a n Item log created. 4 Select the Import button to import the Items. 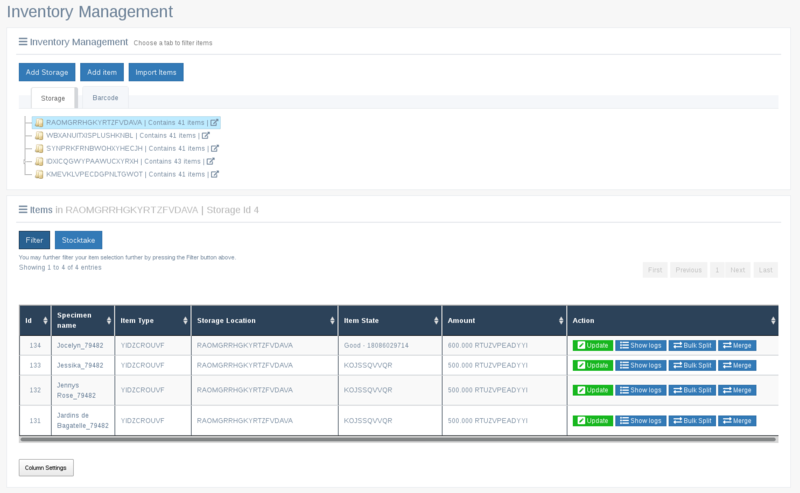 Inventory can be managed with the management interface to allow for bulk stocktake, split, merge and other normal operations. Storage Locations and Items can be added by clicking “Add Storage” and “Add Item”. Items can be imported by clicking “Import Items”. More detail can be found above. Items from a specific storage or a set of barcodes can be displayed. After choosing a set of Items, users may click on (Stocktake) to begin a bulk stocktake. 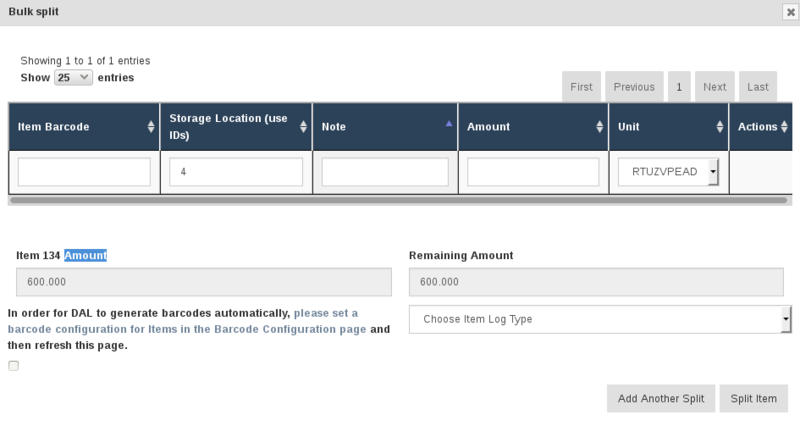 This allows users to update amounts and item states in bulk. Item states are defined in Type definitions (class “State”). After making updates, users may choose the Item Log Type to track changes in each Item’s log. Single Items can be split to be made into multiple items. To split an Item, press on (Bulk Split). For each new Item split, a new row will be displayed. New splits can be added by pressing (Add Another Split). This table describes the fields for each split row. Storage Location A name to identify the Storage location. Amount M New amount. Total split amount cannot excede original Item amount. Unit Unit of new item. By default, this will the original Item Unit. This table describes the fields for the bulk split fields. Remaining Amount The remaining amount of original item calculated from the rows above. Cannot be below 0. Item Log The item log type that will be added to log of new items and original item. Item spliting is a two step process. Firstly, the new items will be created. Secondly, the original item will be updated if the new items are succesfully added. This means if there is an connection interruption to DAL, the original item amount update may fail and the user will need to manually update the original item. Items of the same Specimen and Item Type can be merged to create a new item with a specified amount. To begin a merge, click on (Merge) for each item that is to be included in a merge. Alternatively, add Item Id/s (seperated by commas) in the Item Id field. After items have been chosen, click on (Merge Items) to bring up the merge dialog window. This table describes the fields for each item that is included in the merge. This table describes the fields for the merge items fields. Specimen Id M Specimen Id of new Item. Normally taken from the merged items. This can be changed but is not recommended. New Item Amount The given amount for new item. Normally calculated by the taken amounts above but can be overwritten manually. Storage Location Id Storage location Id of new item. Normally in the same storage of the first item in the merge list but can be overwritten manually. Unit Unit of new Item. Item Type M Item Type of the new item. Normally will be same item type as the merged items but can be overwritten manually. Item Log Type The Item Log Type that will be added to log of exisiting items and new item.